Director of Veteran Affairs Mike Kufchak was happy to help host alongside the Antelope Valley Veterans Employment Committee (whereas he is a sitting board member), on their 2nd Annual Veteran Employer and Veteran Recognition Dinner in Lancaster, Ca. on 15 February 2019. During the Dinner, Local 11 was acknowledged as the title sponsor and was also recognized as the Calendar Year 2017 Employer of the Year. This year Local 11 was honored to pass off the Employer of the Year title to Allied Universal who recruits veterans into the security services. Mitch Klein, who delivered the award on behalf of our Business Manager Mr. Joel Barton, stated the following: The Antelope Valley Veterans Employment Committee working in partnership with Local 11 along our elected officials, businesses, and community leaders and agencies has benefited this area greatly. Because of this relationship the IBEW has received many accolades and has increased its work picture through Community Workforce Agreements. The IBEW answering the call to our heroes coming home and supplying good careers to them has been the most rewarding experience that we could have imagined. 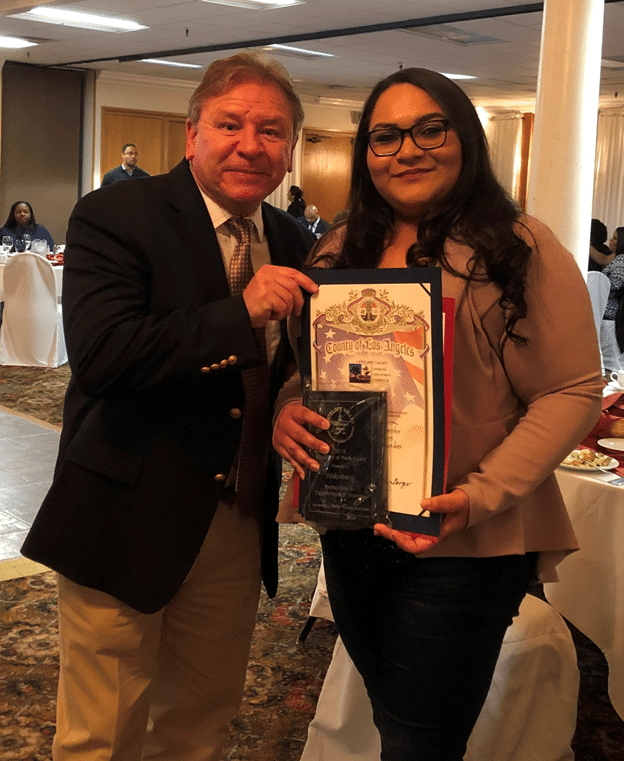 Pictured: IBEW 11 Director of Veteran Affairs Mike Kufchak is pictured with Ms. Laura Rodriguez Human Resources Rep who accepted the award on behalf of Kinkisharyo Rail Car Manufacturer.